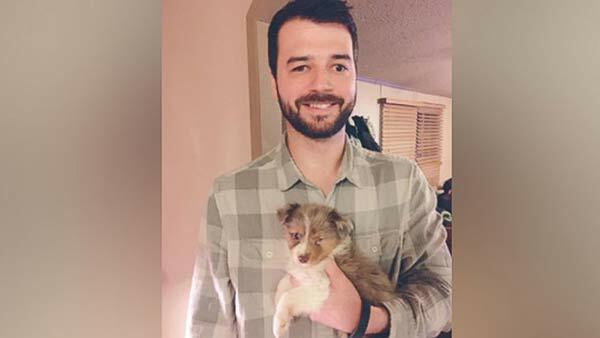 GEORGETOWN, Texas -- A Texas man who lost vision in his left eye as a teen has adopted an adorable puppy who's missing one of his own, ABC News reports. Jordan Trent of Georgetown, Texas, was with his family for the holidays when his wife stumbled across the mini Australian Shepard, who they've named Shiner Solo. "My kids said 'Hey Dad, there's a dog that's blind in his eye just like you,'" Trent, 32, told ABC News today. "I looked at it and it was the cutest dog in the world. He was the last of the litter. We scooped him up and brought him home." Trent said he lost his sight in one eye when he was 15 years old after a piece of metal got inside while he was doing yard work. "[Doctors] kept trying to fix it, and eventually there was no hope," Trent's sister Kendra of Woodward, Oklahoma, told ABC News. "He's been really great about it. He told everybody in school that he was going to get a cow's eye as a transplant. He kept making jokes to make everyone feel comfortable." Kendra, 27, posted a photo of her brother with his new pet yesterday on Reddit where it quickly racked up 2.6 million views. "I told him, 'It's getting big, it's kind of crazy,'" Kendra said. "Jordan, he is a good, good guy, so it's really fun to see all the love and support. He totally deserves it." As for Shiner Solo, Trent said his missing eye doesn't slow him down and that his two kids love their new family pup.